Clean rooms and all of their constituent parts and accessories are subject to extremely strict standards and regulations. These standards are set by a variety of governmental and international standards-setting bodies including the United States government and the ISO. These standards are necessary because of the sensitivity of operations conducted in clean rooms. 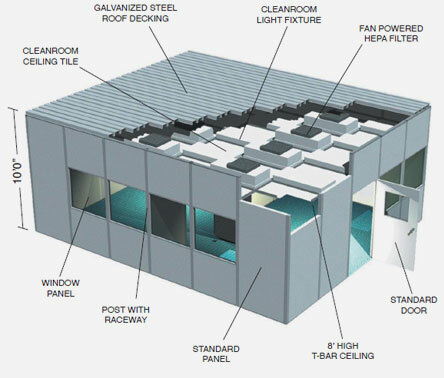 Custom Designed Cleanroom – Abtech, Inc.
Semiconductor fabrication, biotechnology research, nanotechnology development, medical testing, electron microscopy and many other high-tech, highly sensitive operations require access to clean rooms of varying levels of decontamination. Clean room equipment like filters, personnel decontamination air jets, clean room suits (also known as bunny suits), and other equipment all contribute to controlling the presence of contaminants in clean rooms. The most advanced clean rooms can even feature oxygen supplies for workers; this can be the case in research operations involving the study of infectious diseases or dangerous chemicals. The US FED STD 209E standard system rates clean rooms based on the number of 0.5 micrometer-sized particulates present per cubic foot within an enclosure. The classification number they assign clean rooms corresponds to the particulate volume number. For example, Class 1 clean rooms should feature no more than one 0.5 micrometer-sized particle per cubic foot of atmosphere within their enclosures. In order to achieve this extremely low level of contamination, Class 1 clean room designs must feature several high-efficiency particulate air (HEPA) filters working in concert with other decontamination equipment. As the class numbers become higher, so does the acceptable level of particulate presence. For example, Class 10,000 clean rooms should have no more than 10,000 0.5 micrometer-sized particles per cubic foot. If normal, unfiltered air was subject to this classification system, it would be Class 1,000,000. The lower the class, the more likely the clean room is to be permanent with hard walls and complex filtration and personnel decontamination measures. 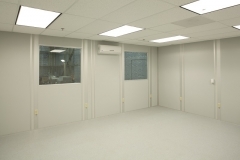 Higher class clean rooms can sometimes be modular and portable; these clean rooms provide basic protection and can be moved easily and disassembled without difficulty. Whatever a clean room’s design, it dictates the kind of operation for which the clean room can be used. >Cleanroom Design Clean rooms and all of their constituent parts and accessories are subject to extremely strict standards and regulations. These standards are set by a variety of governmental and international standards-setting bodies including the United States government and the ISO. These standards are necessary because of the sensitivity of operations conducted in clean rooms.